Ron Newman, the Hall of Fame soccer coach who passed away Monday, meant so many things to so many people. He was a pioneer in the American game, a successful indoor and outdoor coach, and a master psychologist with a little bit of showmanship thrown in. 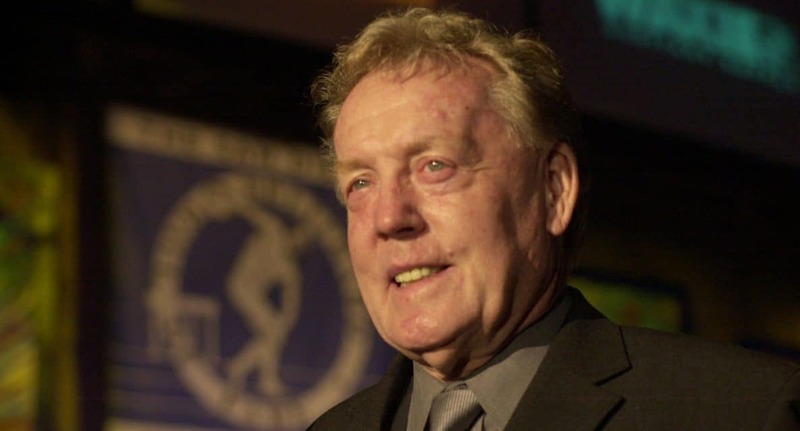 The National Soccer Hall of Famer cast a giant shadow on the sport. While covering the Rochester Lancers for the Rochester Democrat and Chronicle back in the way, I could not help but notice the the 1976 draft picks for the the North American Soccer League team was virtually the same for the Los Angeles Skyhawks of the American Soccer League. On Jan. 14, 1976, the Lancers selected four All-Americans — Quincy College’s Jim Pollihan, Baltimore University’s Dale Rothe, UCLA’s Terry Lippman and Southern Illinois’ Steve Cacciatore. Was that a coincidence or a carefully constructed plot? At the time, the Lancers did not have exactly the best of reputations. After capturing the 1970 North American Soccer League title and reaching the 1972 CONCACAF Champions Cup, the team endured three consecutive losing seasons, including an utterly forgettable 6-16 record in 1975. So perhaps Newman was trying to “steal” those draft picks right out from under the Lancers’ noses. The NASL was the first division league, the ASL was a first-division wannabe. Hmmm. I still wasn’t convinced. 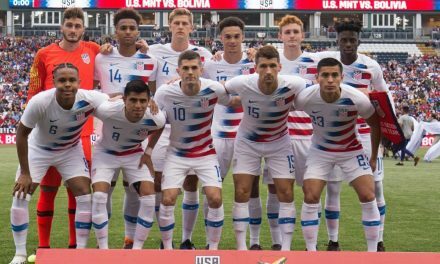 Newman said that ASL rules required that 11 of a 17-man roster be U.S. citizens. The NASL’s quota at the time was six. “Let’s face it, they have a better chance to play here,” Newman said. 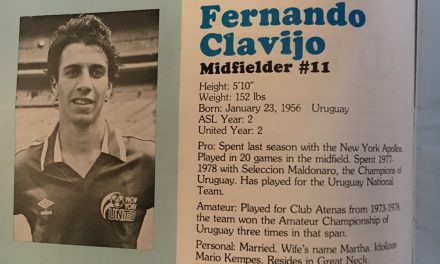 Of course, signing with an NASL team would give players a chance to play against the likes of Pele and some other big-name European and South American stars teams were signing at the time. “If I had a decision to play or sit the bench in glory, I’d rather play,” Newman said. Both teams had happy endings that season. The Lancers did eventually sign Pollihan, Rothe and Lippman and reached the playoffs for the first time since 1972. The Skyhawks? They not only made the playoffs, but won the ASL title as Newman became the only coach to direct teams to championships in both leagues. 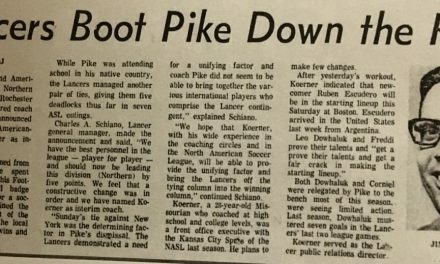 (By the way: one Lancers draft choice Newman did not go after that year was someone named Dave Sarachan, a midfielder-forward out of Cornell University. Hey, if anyone knows whatever happened to this Sarachan guy, please let me know). While he knew his X’s and O’s, Newman was in many ways a modern coach. He understood the psychological end of things, knew how to motivate players and sometimes stay out of their way. When the legendary George Best was pulled from a game, the Northern Ireland great threw his shirt at Newman, who diffused the situation by saying he always wanted Bestie’s shirt. Perhaps he was best known for what transpired prior to a match early in the 1978 NASL season. So, when the Fort Lauderdale Strikers stumbled to a 0-3 start and was outscored 13-2 at the start of the 1978 season, the team and Newman concocted a pregame ceremony that would at least get the fans pumped up. Needless to say, the 7,718 spectators loved it and Fort Lauderdale recorded a 2-0 win. Believe it or not, the Strikers found their stride and eventually reached the playoff semifinals. I don’t think something like that would go over that well in the antiseptic MLS these days. Of course, in those days, American soccer was like the Wild, Wild, West, anything went to get publicity and fannies in the seats. As good as he was at showmanship, Newman could coach a bit, too. He directed the Dallas Tornado to the 1971 NASL crown. The Tornado accomplished it the hard way, playing not one, not two, but three playoff games that went beyond the 120-minute mark. In those days, the NASL decided to let the games play out. So, the Tornado played and lost a 176-minute marathon to the Lancers in the first game of the playoffs and won the deciding third game by capturing a 148-minute marathon on a goal by Bobby Moffat (he is helping organize the 50th anniversary celebration in Dallas in October). In the final series, Dallas dropped a 2-1 decision to the Atlanta Chiefs in a scant 123 minutes and 48 seconds in the first match of the best-of-three game series. With only 47 seconds remaining in regulation, Newman almost pulled off some heroics himself as he put the ball into the back of the net only for the goal to be nullified due to offside. It wasn’t the last time Newman suited up as coach. During the 1979 NASL players strike, he wore the Strikers uniform at the age of 44 and played for the final 30 minutes of a 4-0 defeat to the Washington Diplomats. Newman came on as a substitute in the 60th minute as he got a once-in-a-lifetime opportunity to play with his son, Guy. “It was the only time we [Guy and Ron] played together,” Newman said. “It should have been a charity exhibition game. As it turned out, Newman’s best days were ahead of him. After joining the San Diego Sockers, he coached the team to 10 indoor titles in 11 years in the NASL and Major Indoor Soccer League. Beyond indoor glory, Newman, along with former Tornado goalkeeper Kenny Cooper (yes, that Kenny Cooper, the father of former MLS striker Kenny Cooper Jr.), helped define the game by introducing tactics in the fast-paced indoor game that are still around today. How big of an influence did Newman have? Well, the Major Arena Soccer League has named its championship final after the English native, the Ron Newman Cup. I realize the passing of Ron Newman will be lost in the shadows of the deaths of John McCain and Neil Simon, but the man cast a pretty giant shadow himself in the soccer universe and American soccer was much better off for having him in it. 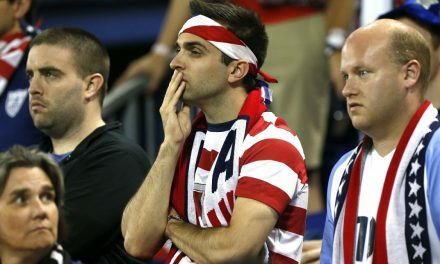 OFFSIDE REMARKS: Is this the time the U.S. fails to reach soccer’s promised land (the World Cup)?